This paper presents the practical processes of remodeling and using a kiln in the Ceramics studio at the Margaret Trowell School of Industrial and Fine arts, Makerere University in Kampala, Uganda. The effectiveness of a kiln is dependent on its design, ability to preserve heat by minimizing heat loss, and the capacity to be economical with fuel. The kiln in the ceramics department used waste oil for firing. During my postgraduate studies spanning 5 years in Japan, I studied and worked with wood kilns – building them and firing in them. 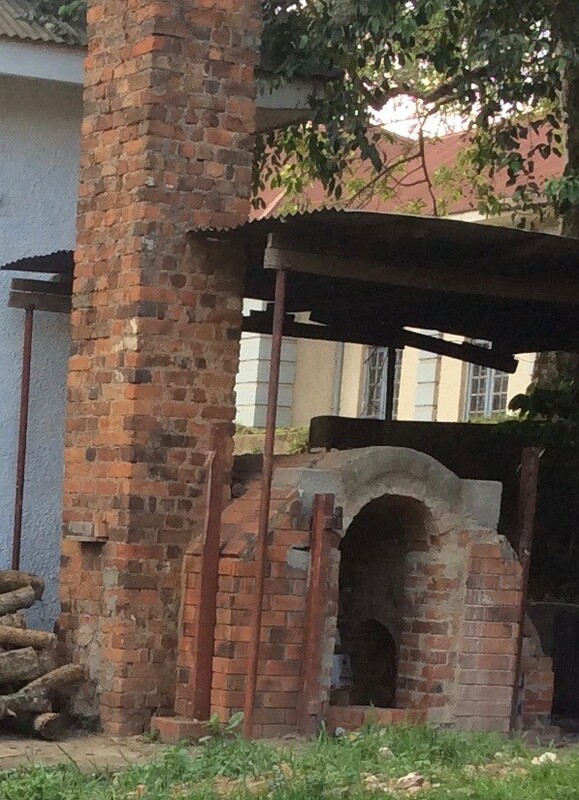 Upon returning to Uganda in 2015 with this experience, I was able to identify some of the problems associated with Makerere Art School’s waste oil fired kiln and its hardships. In the waste oil method one uses a blower to stoke the fire. It is hard to regulate the amount of air. Often, there was too much air blown that most of the heat escaped through the chimney. I could see that students were going through a difficult time to fire their pottery wares. 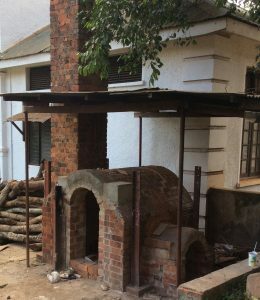 With that situation, I sought to use my experience of working with wood fired kilns to remodel the pre-existing waste oil fired kiln. I discussed these shortcomings, and suggested possible changes to the Head of the Ceramics Department, Dr. Angelo Kakande. 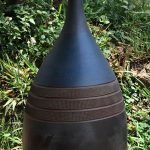 I proposed a change to wood fired Bizen-like pottery techniques and kiln firing procedures, and explained how the remodeling process of the kiln would happen. 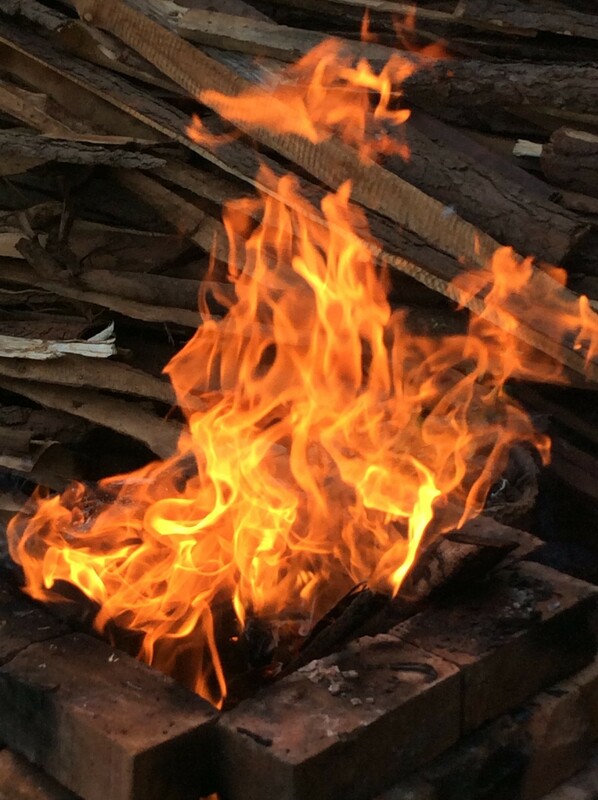 Unlike waste oil, wood would be readily available, cause much less air pollution, and give us more interesting patterns and finishes than the relatively flat results from waste oil firing. Dr. Kakande liked my ideas. I worked with a team of four artists including two lecturers: Mr. Edward Balaba and Mr. Andrew Ssekibaala; and two students: Ms. Angeyo Nikitte and Ms. Shelia Mutaawe, who were undertaking their industrial training program with the ceramics department. Switching to wood away from waste oil, electric, or gas kilns made sense especially because electric power supply and voltage are erratic. Over the course of five years in Japan, I participated in two or more wood firings each year. I had considerable experience. Wood would reduce our fuel costs, mitigate the air pollution problem, and improve studio safety. It is hard to control waste oil during firing especially when trying to fire different atmospheric processes, for example in an attempt to achieve oxidation. 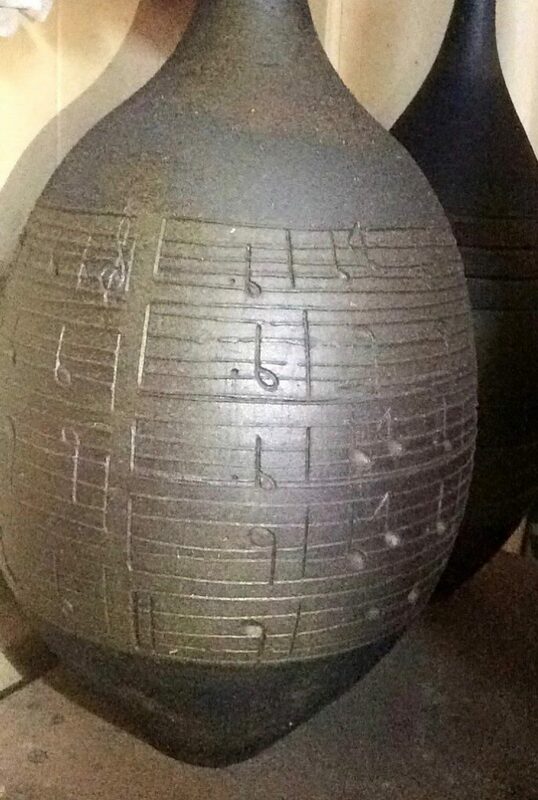 Waste oil can burn too rapidly causing cracks in the pottery. 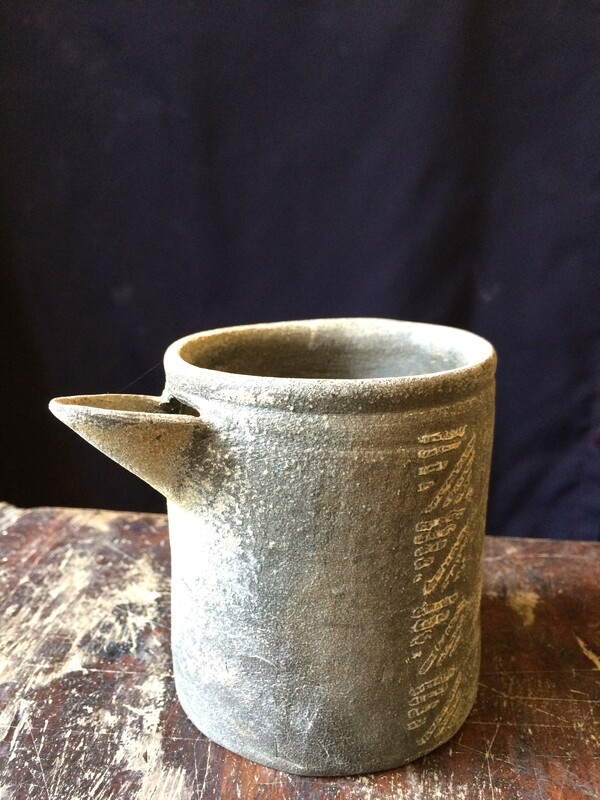 Wood firing was an aesthetically suitable choice because fire markings would lend the pottery a natural beauty. Kusakabe and Lancet (2005, 4) discuss reasons why ceramists keep opting to use wood in their firing, talking of the results,“ It’s not an “Oh, that`s lovely,” sort of beauty but an extraordinary beauty” They go on to describe wood fired pieces as possessing “…a heart achingly arresting beauty, a beauty of epic proportions, a beauty worth working for, a beauty only achieved by way of wood-firing.” We aimed for this aesthetic. 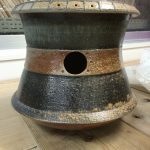 Bizen province survives as a thriving ceramic center and is among the six ancient kiln sites of ceramic production since Kamakura era (1185-1338) in Japan. 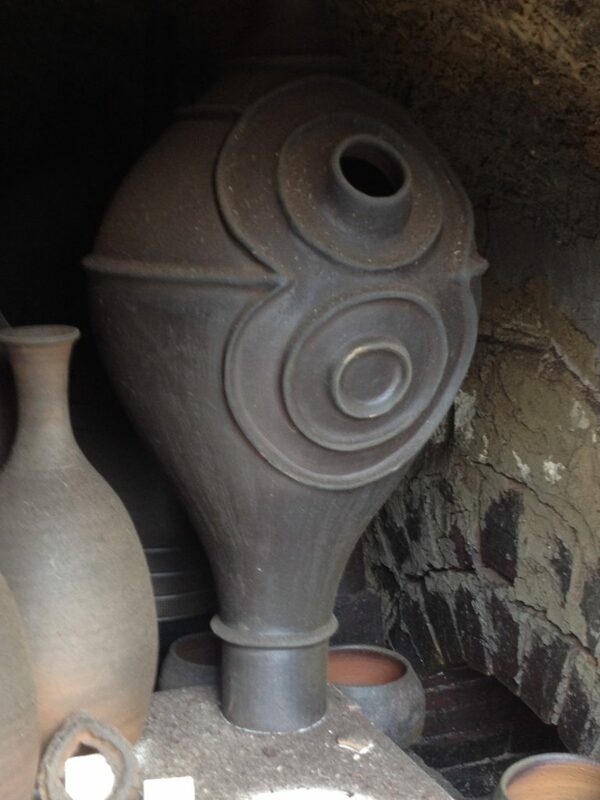 Bizen pottery has been produced for over 1000 years. Most other pottery centers have lost the dynamism that peaked in the Momoyama era (1568-1615). 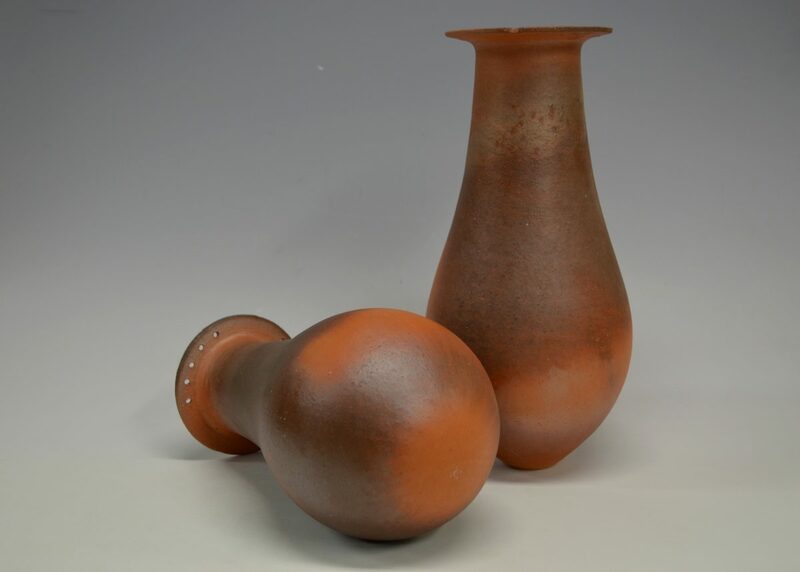 Bizen clay can be characterized as having high iron content, more plasticity, and contains quite a lot of organic matter. 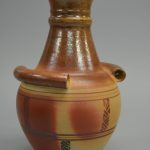 When fired, it attains significant hardness due to the high temperatures of about 1200 degrees Celsius, earthen-like and reddish in color, with no glaze, although there may be traces of molten ash that look like glaze. Since Bizen has a little less iron and more potassium, it can fire at high temperatures and can thus be called stoneware clay. 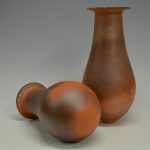 Figure 1: Wares showing some of the characteristics of Bizen ware. 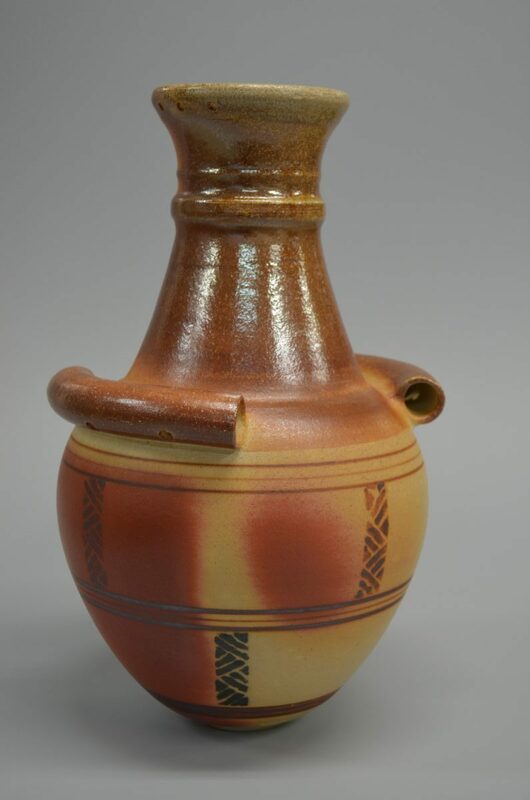 In Uganda today the variety of clay wares includes architectural pottery such as half and solid clay bricks; tiles for roofing, flooring and walls; decorative pottery, for instance, flower pots; and some household utensils like water pots, bowls, and mugs. 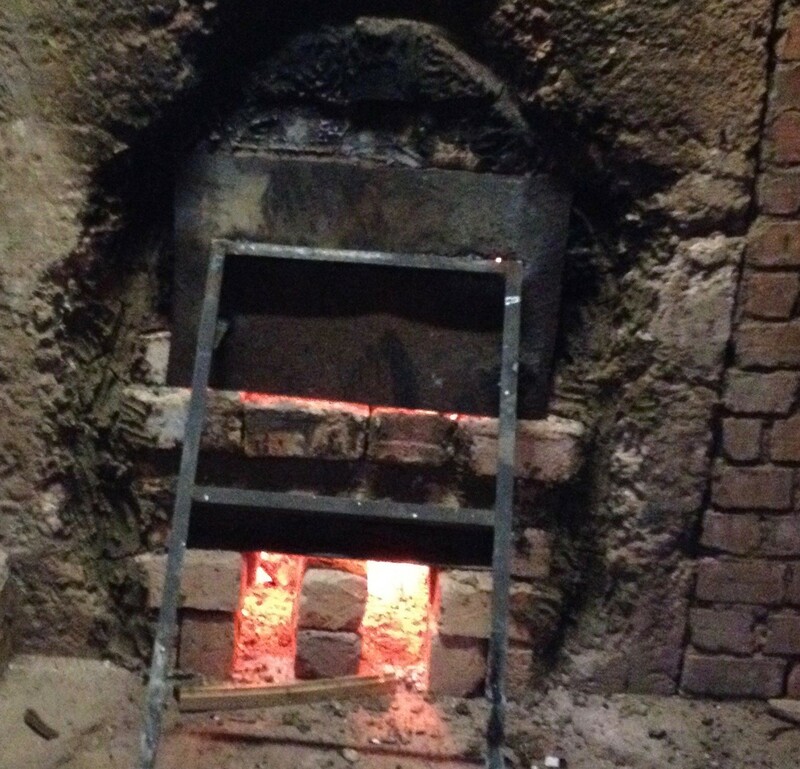 These are fired in traditional kilns at low temperatures ranging between 900 – 1000 degrees Celsius. Consequently, these wares are water absorbent and need repeated sealing in order to reduce their porosity. This contrasts with Japan where similar items are fired to their vitrification point, where all pores seal and the ware transforms to the glass phase. 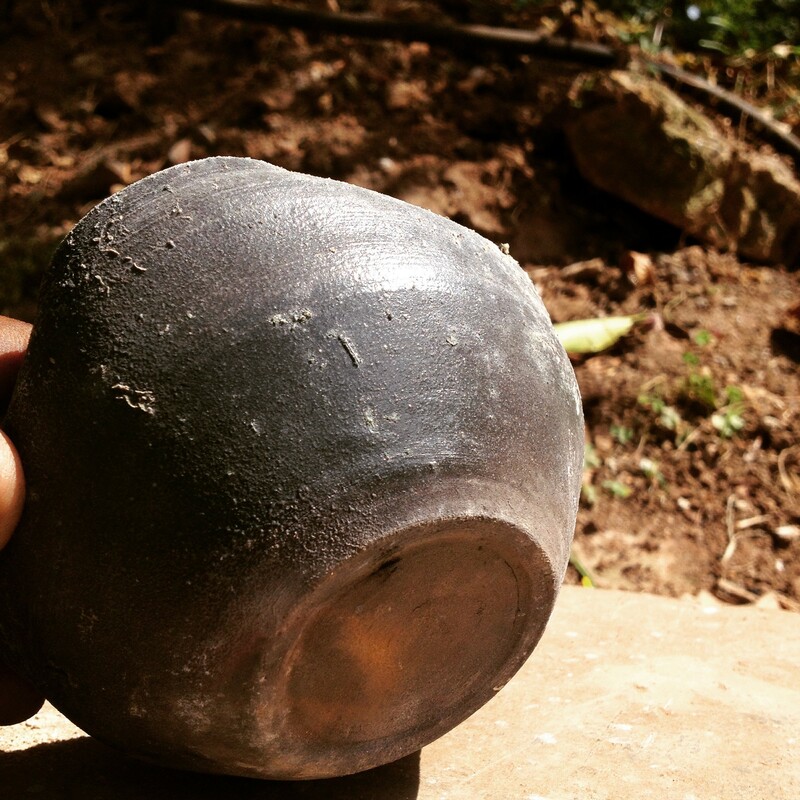 During my time in Japan, from 2013 to 2015, I carried out experiments to compare Ugandan clay bodies with Bizen clay. I found that clay in Uganda has higher iron content than Bizen clay, but there are similar in plasticity. Therefore, to attempt to create Bizen-like pottery in Uganda, it called for making a clay body with qualities similar to Bizen clay. We took local clay, mixed it with kaolin and sand to increase the strength of the clay body. Then we tackled the issue of glazing. It is difficult to find good quality and affordable glazes in Uganda. There is minimal , and often no use, of glazes by local potters. We could solve this problem by using Bizen techniques where the wares are fired without glazes yet the results show traces of glaze. 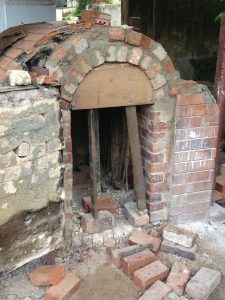 Figure 2: The old kiln door, firebox and interior near the bag wall area. 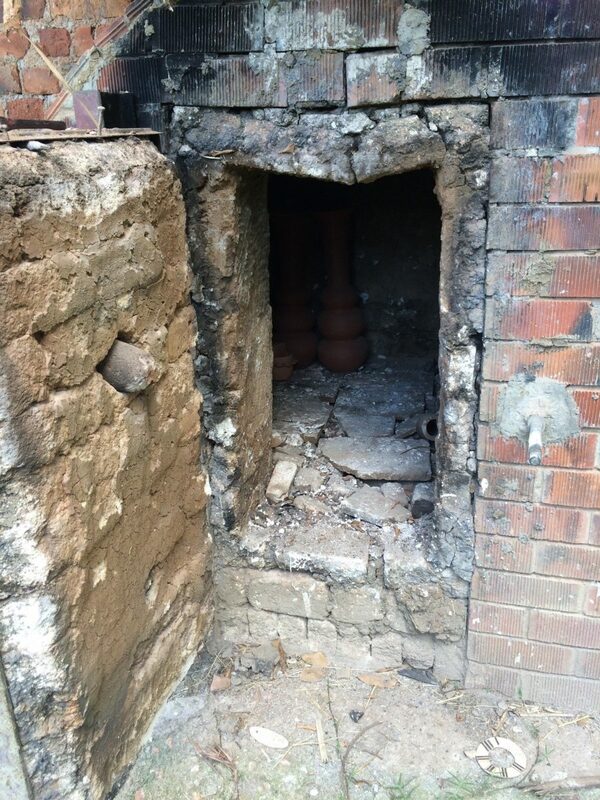 The kiln was in very bad shape. The four of us divided into two groups for the construction process to try and get the work done easily and fast. One team was responsible for the door area and the other for the firebox area. Each team had to mix their portions of refractory material that I supervised in order to have the right mixtures. 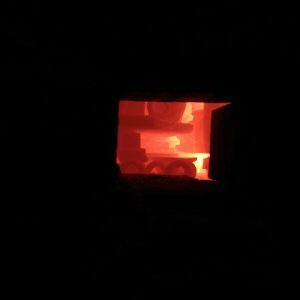 A refractory material is one that retains its strength at high temperatures. We kept exchanging ideas as we planned, cut bricks to fit specific areas, and built. 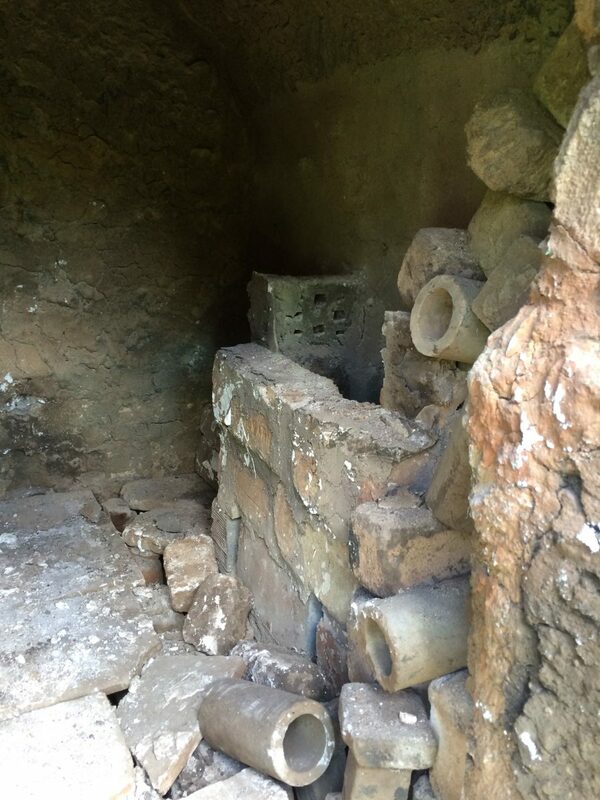 Previously, the kiln had a small pre-fabricated door that did not allow for easy loading and off-loading of wares. We enlarged and modified this door area into a brick-up door. Door construction started with taking away the surrounding bricks from the bottom to the arch level. This helped to have stronger bricks by the door as compared to the previously soft ones. At the top of the door area an arch form was designed and completed. 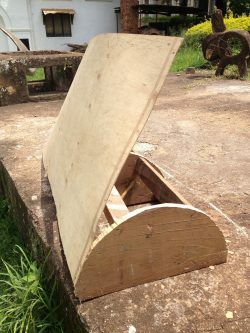 This form was more likely to last longer than a straight-topped door due to constant expansion and contraction during firing and also when bricking up the door it would help have a tight fix as compared to when it is flat topped. To achieve the arch shape, we used a wooden arch-former to support the arch design. It was held in place by concrete mixed blocks that we cast on either side of the door for extra support as shown in Fig 5. We restructured the bag wall and built it all the way from the interior of the kiln. 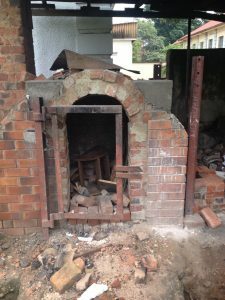 It was vital to have support for the arch bricks during the remodeling process because most of the repairs, in one way or another, came into contact with the kiln interior. We needed to take general studio safety precautions. After securing the interior of the kiln, we were able to extend and enlarge the firebox by opening up a section bigger than the previous one all the way into the chamber. We could not do this before supporting the inner section. We had to prevent the entire kiln from collapsing. 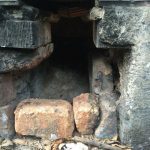 As we restructured the firebox, cracks developed in the exterior walls and those had to be fixed and prevented from expanding. We used bamboo to support the interior arch area because of bamboo’s qualities of strength and flexibility. Bamboo could take the uneven shape of the interior and door area, and was readily available from the Art School’s bamboo grove on the grounds. With the firebox, we encrusted the floor with a layer of sand to create a leveled ground. We then arranged bricks on top of the sand leaving minimal spaces between them of about 0.5 – 1cm. 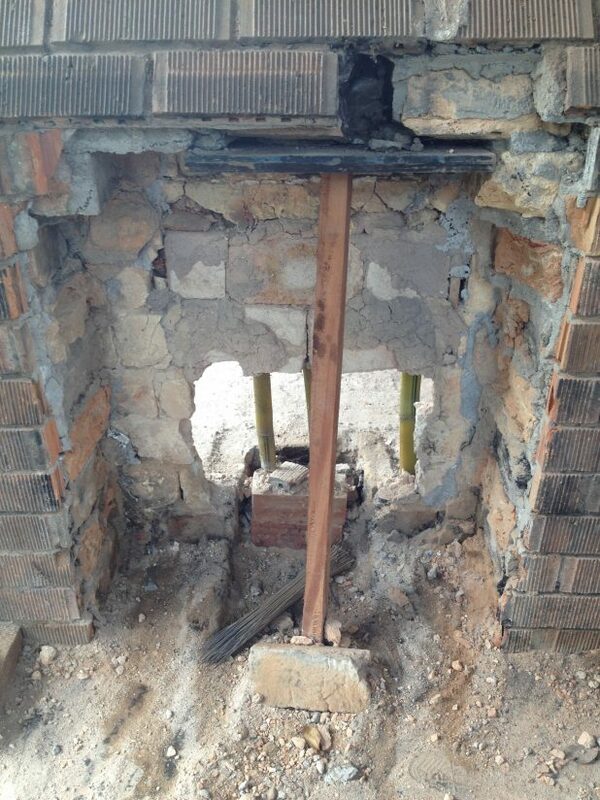 We then filled these spaces with a fire resistant mortar to join the floor bricks and keep them in place. This was time consuming because the bricks had to be carefully cut based on where they were to be placed to have a firm fit. 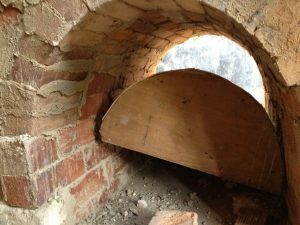 When we attained the required height of 30cm, we made an arch former for the firebox using solid wood and a piece of plywood on which carefully cut bricks were fitted to form a dome-like structure. 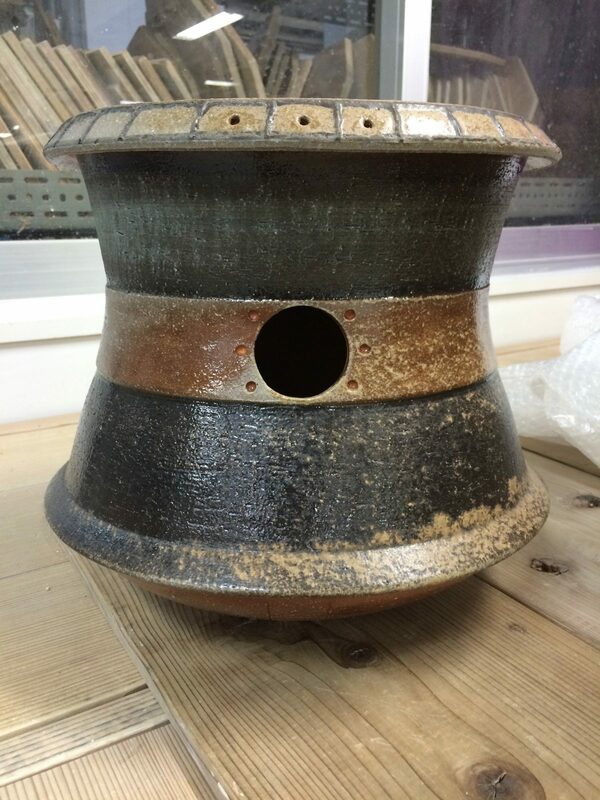 This would enable easy movement of the heat off the flue source to transcend into the chamber of the kiln. 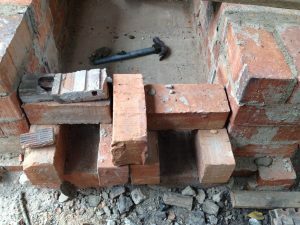 When the firebox construction was complete, and the mortar had set, we removed the former onto which the bricks had been laid. We then put a refractory body consisting of clay, sand, kaolin and grass on top of the arch bricks. Finally, with modifications complete, it was time to test the kiln for its efficiency. 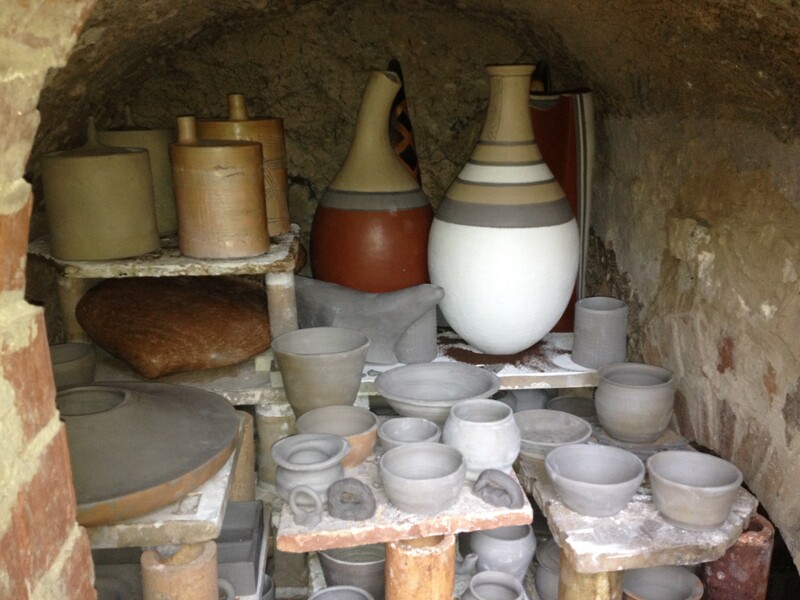 The enlarged door area was to help with easy loading and off loading of varying sizes of works into the kiln. 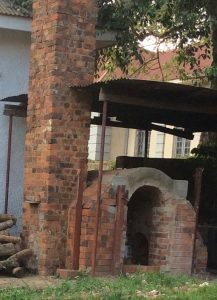 We assumed that the enlarged firebox would be better for wood combustion and allow measurable intake of secondary air through the flues at the bottom of the firebox into the kiln, which would all be regulated by the help of the damper in the chimney. 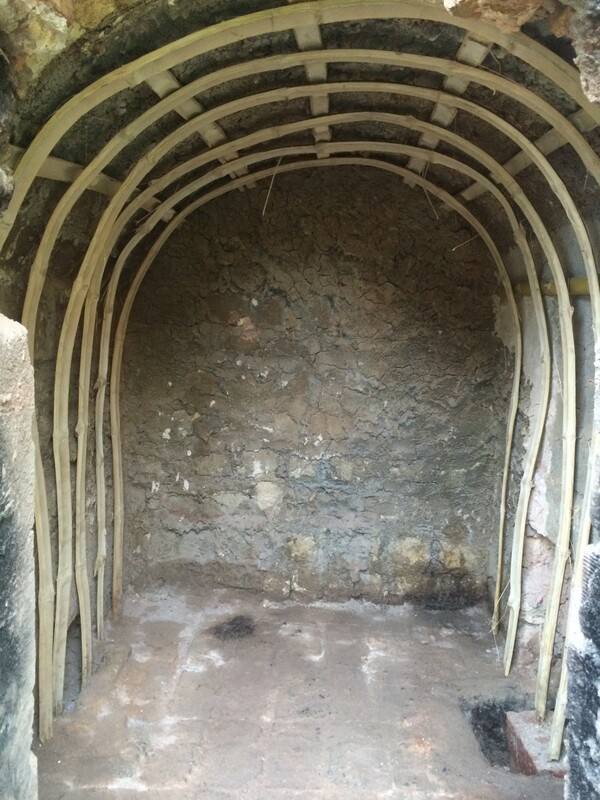 Fig 3: The interior chamber of the kiln supported by shredded bamboo. Fig 4: Firebox section enlarged and upper bricks supported. The lighter bricks are the inner bricks, which were also removed and the whole area remodeled. Fig 5a: Door area with the arch former during it`s construction and the other finished with the concrete blocks on the sides. Fig 5b: Door area with the arch former during it`s construction and the other finished with the concrete blocks on the sides. 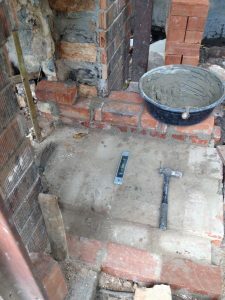 Fig 6: Construction of the firebox and the finished door area. 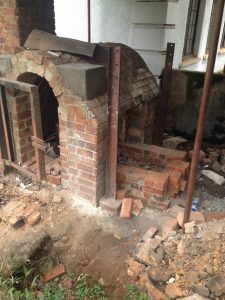 Fig 7: Readying the firebox area to hold its structural arch-former. Fig 8: Completed firebox arch and removing the former. Fig 9: The kiln and the damper area. 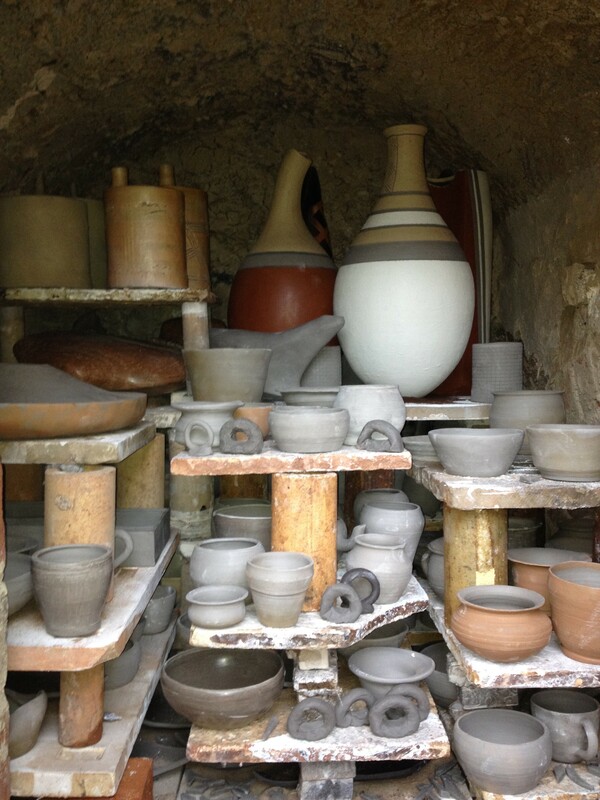 We made various forms of pottery including cups, bowls, platters, and large vessels. 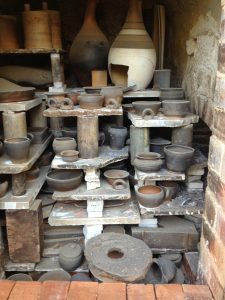 However, we did not accumulate enough work to fill the kiln to capacity, hence there was still some unused space especially close to the door. Fig 10: Green ware objects loaded into the kiln ready for firing. We were careful when sourcing wood for the firing. We looked for dry wood, chopped and split into pieces where possible, to fit the size to the new firebox. 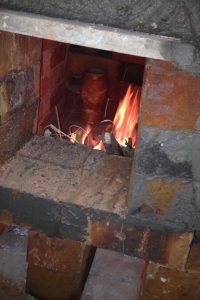 Wet wood would not yield a successful firing because it would draw a lot of oxygen from within the kiln to dry itself first before being able to burn. This would have made the firing lengthy and tedious. We were fortunate to get fairly priced wood off cuts from carpentry workshops readily available in Bwaise area close to Makerere. Figure 11: Main stoke hole wide open at the beginning of the firing. Figure 12: Secondary holes at the bottom of the firebox. 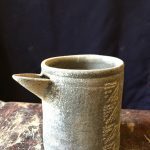 Since most of the work was being fired for the first time, that is, as green ware, we had to be careful when starting the fire and when raising temperatures. The heat was minimal in the beginning. We were able to have full control of the firing at the right speed. This allowed consistence in the firing atmosphere for materials such as oxides to change properly. The main stokehole and secondary holes were wide open to allow more air into the kiln and preheat the kiln. During slow firing we smoked the pottery for about six hours at about 300o C in order to get rid of moisture in the wares. This was helpful in preventing cracking which can happen with sharp raises in temperature. 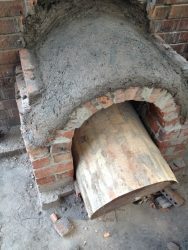 The kiln also needed to dry slowly since it had newly constructed sections. After the moisture was out, we then increased the heat drastically. We found that using carpentry wood off-cuts, especially thin ones, burnt faster and gave off much more heat. 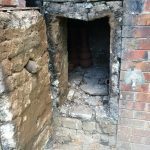 The new brick door reduced the amount of air going through by separating the main stokehole from the secondary air vents at the bottom of the firebox. We controlled the firing by opening the main stokehole when wood was inserted into the firebox, and closing it after the stoking was done. 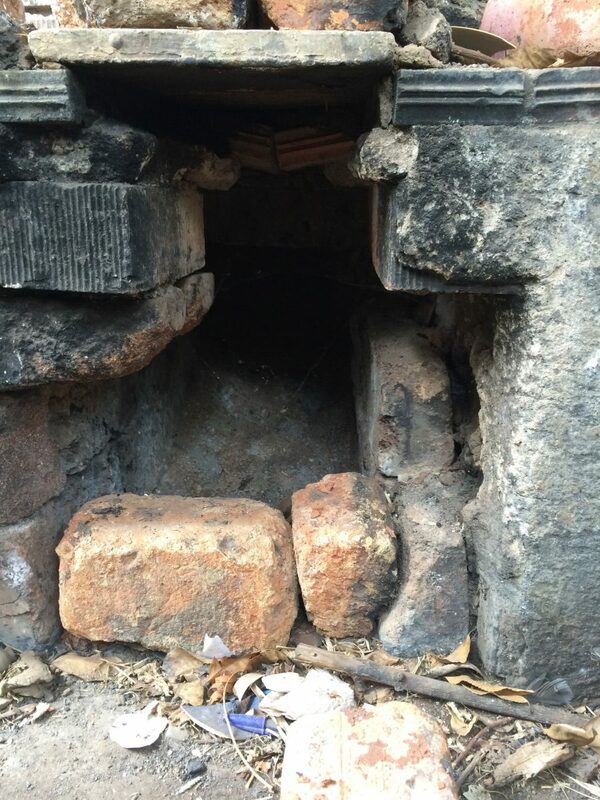 The secondary holes at the bottom of the firebox then provided air for wood combustion. When we deemed that too much air was going in, we placed a brick in the hole to reduce it. We also used the damper to regulate temperatures and heat flow in the kiln chamber and through the chimney. Using the bottom vents and the damper we were able to control the accumulation of embers in the firebox. When we needed slow burning, we pushed the damper slightly inward into the chimney to reduce its pull, and when fast burning was required, we pulled it slightly outward. We used these same methods with the bottom vents on the firebox. Figure 13: The main stokehole closed and bottom holes open. The firing continued up to a point when the colors inside the chamber changed from pitch black to a dull orange, through to a bright orange tending to white. We viewed all this clearly through the spy hole. Unfortunately, during this first firing we could not access a pyrometer or seger cones to measure the exact temperature. We used the human eye instead, which was not accurate especially during the day. The entire firing lasted about forty-eight hours. 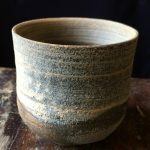 In our Bizen-like firing, ashes kept rising and moving through the kiln when the firebox was stoked with wood, resting on the pottery wares. As temperatures rose, the ash started to melt, forming a glaze-like surface, and also allowed the clay body materials to vitrify and bond together. Fig 14b: Flames within the kiln as seen through the spy holes. It took three days for the kiln to cool. We then opened the door. The wares had accumulated considerable amounts of ash but it had not melted on most of them. Only a few pieces close to the bag wall had ashes starting to melt. We realized that we had failed to reach the desired high temperatures. Despite this setback, some of the bodies had become tight and could hold water. Others attained interesting color combinations showing the movement of flames and ashes in the kiln. The dark tarn color of the wares indicated the presence of high amounts of iron in the clay bodies. 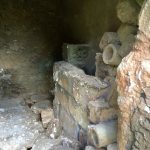 Fig 15a: The interior of the kiln after firing. Fig 15b: A cup that had some traces of melted ashes. Since we did not succeed at getting the desired high temperatures of about 1200 degrees Celsius with wood, we put forward two suggestions for future attempts. First, in order to raise temperatures, to renege on exclusive use of wood for fuel, suggesting instead a combination of wood and waste oil. The insulating bricks appear to have retained heat and given off less. We assume that using waste oil which necessitates a blower might give off more heat than can be kept by the bricks, allowing more of that heat to reach the wares. 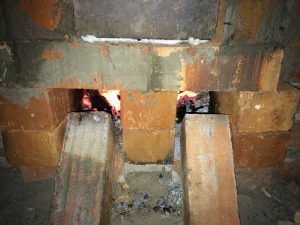 Secondly, we suggest rebuilding the inner walls of the kiln with high-density bricks that give off heat as compared to insulating bricks that would normally retain heat. In conclusion, the kiln proved to be better with regard to reducing fuel costs, and even if we did not reach our desired temperatures in order to get self-glazed wares. The clay bodies received the heat very well and did not suffer any cracks. As we experiment more in the future, we believe each firing will keep producing more interesting results. Fig 16: Other wares from the same firing with cups having some traces of melted ashes. Gregory, Ian. Kiln Building. London: A&C Black, 1995. Masakazu, Kusakabe, and Marc Lancet. Japanese Wood-Fired Ceramics. Iola, WI: kp books F + W publications, 2005. Olsen, L, Frederick. The Kiln Book. 2nd edition. London: A and C Black (Publishers) Ltd, 1983. Pitelka, Vince. Clay: A Studio Handbook. Westerville, Ohio: American Ceramic Society, 2001. Ronald, Mpindi Kibudde: Improvement of Ugandan Pottery: a case study of using Japanese Bizen pottery. 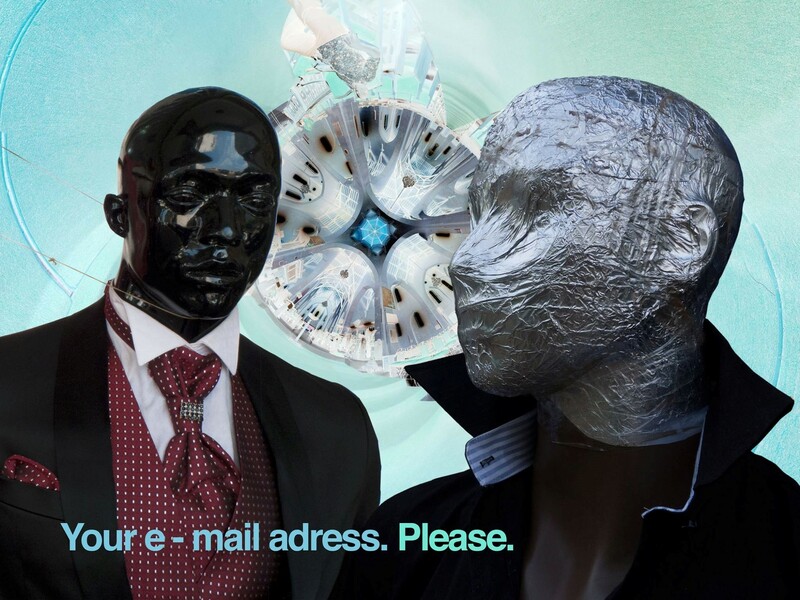 PhD thesis, Tokyo University of the Arts, 2015. Dr. Ronald Mpindi Kibudde is a ceramic artist and graduate of Makerere University and Tokyo University of the Arts. He teaches Ceramics and Drawing at Margaret Trowell School of Industrial and Fine Arts, Makerere University.